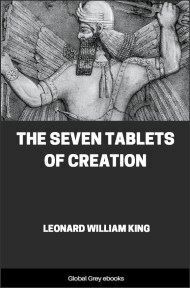 Chapters include: Discovery Of The Tablets; Publication Of The Creation Tablets; The Object Of The Babylonian Legend Of The Creation; Variant Forms Of The Babylonian Legend Of The Creation; The "Bilingual" Version Of The Creation Legend; The Legend Of The Creation According To Berosus And Damascius; and more. A perusal of the texts of the Seven Tablets of Creation, which King was enabled, through the information contained in them, to arrange for the first time in their proper sequence, shows that the main object of the Legend was the glorification of the god Marduk, the son of Ea (Enki), as the conqueror of the dragon Tiâmat, and not the narration of the story of the creation of the heavens, and earth and man. The Creation properly speaking, is only mentioned as an exploit of Marduk in the Sixth Tablet, and the Seventh Tablet is devoted wholly to the enumeration of the honorific titles of Marduk. It is probable that every great city in Babylonia, whilst accepting the general form of the Creation Legend, made the greatest of its local gods the hero of it. 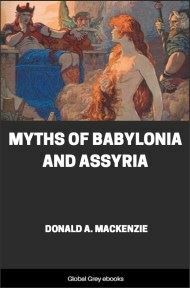 It has long been surmised that the prominence of Marduk in the Legend was due to the political importance of the city of Babylon. And we now know from the fragments of tablets which have been excavated in recent years by German Assyriologists at Ḳal'at Sharḳât (or Shargat, or Shar'at), that in the city of Ashur, the god Ashur, the national god of Assyria, actually occupied in texts of the Legend in use there the position which Marduk held in four of the Legends current in Babylonia. 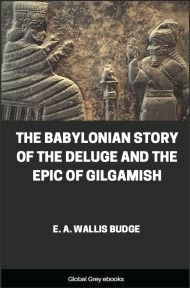 There is reason for thinking that the original hero of the Legend was Enlil (Bel), the great god of Nippur (the Nafar, or Nufar of the Arab writers), and that when Babylon rose into power under the First Dynasty (about B.C. 2300), his position in the Legend was usurped at Babylon by Marduk. The views about the Creation which are described in the Seven Tablets mentioned above were not the only ones current in Mesopotamia, and certainly they were not necessarily the most orthodox. 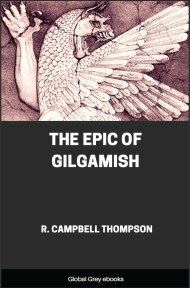 Though in the version of the Legend already referred to the great god of creation was Enlil, or Marduk, or Ashur, we know that in the Legend of Gilgamish (Second Tablet) it was the goddess Aruru who created Enkidu (Eabani) from a piece of clay moistened with her own spittle. And in the so-called "bilingual" version of the Legend, we find that this goddess assisted Marduk as an equal in the work of creating the seed of mankind. This version, although Marduk holds the position of pre-eminence, differs in many particulars from that given by the Seven Tablets, and as it is the most important of all the texts which deal directly with the creation of the heavens and the earth, a rendering of it is here given.